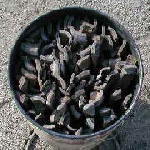 I received nearly 200 e-mails on how to produce bamboo charcoal and what are its medicinal benefits. I am not any charcoal maker nor do I have experience making it, so I had to ask my staffs together with a charcoal specialist to go to a resort house in Kyoto where my brother and I planted bamboo tree. Because of tremendous number of questions, we plan to explain it here. 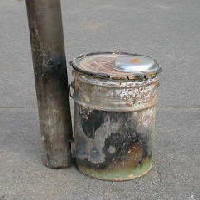 A drum can with cover. Chimney. 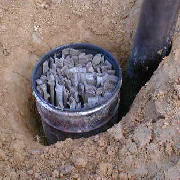 You can use any used metal water pipe about 12 cm in diameter and 90 cm in length. Tinplate sheet about 15 cm x 20 cm in size. You can also use the cover of a cookie can. 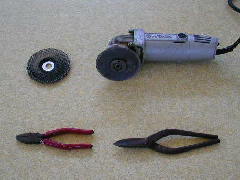 First, cut the drum can with the grinder to make an exhaust of about 8 cm x 8 cm. Bend the upper side of the cut to hold or set the chimney as seen below. Grind the drum can cover to make a hole of about 8 cm x 8 cm. Cut the chimney as seen below. This chimney will be set to the bent side of the drum. 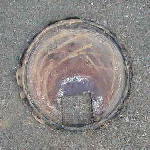 From below photo, the blue tinplate sheet (used for adjustment of the air) should be made to cover the hole. How about the chimney? Fire will be set on top of the bamboo. Gradually, the fire moves under, and the smoke passes by the chimney from the hole under and keeps escaping. 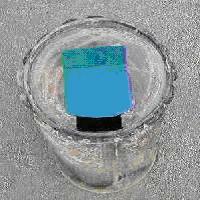 In the drum can, the convection of the air occurs. Finally, you completed the charcoal-grilled instrument. Now place large size of bamboo cuts at the bottom of the drum can with some space. 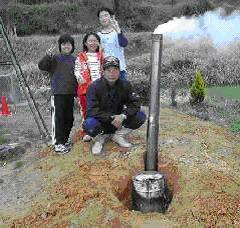 This is to improve the flow of air to the chimney. 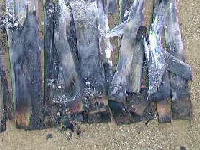 Usually, bamboos placed at the bottom will not burn well and fail to become charcoal. Bamboos should be arranged perpendicularly and close to chimney as seen below. You can place as many bamboos as you can. You can probably make a hole on the bamboo culms (jointed stems) to help it ignite better. On the upper part of the drum, make a space of about 3-4 cm. In this space, old newspapers or small branches are placed for ignition. Let's start excavating for drum can as seen below. 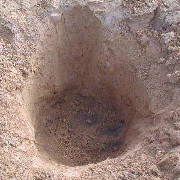 The depth of the hole should be about 8 cm deeper than the drum can. 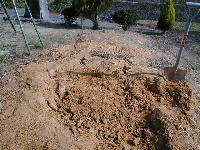 If you cannot dig, you can also utilize a mountain of soil to cover the entire drum can. 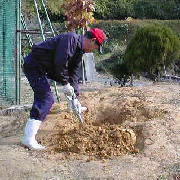 You must also dig some additional space where the chimney will enter. 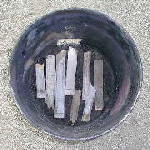 After the excavation, place the drum can and the chimney in the hole. As seen on the left photo, the chimney should be set away from the drum can. In addition, make sure the chimney is easy to pull out. After installation, start surrounding the drum can with soil. 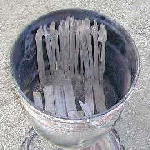 Start igniting the old newspapers or small branches on top of the drum can, then close the cover. If it reaches the point where flames flow to the lower part of the drum can, then you must adjust the thermal power. Adjust the thermal power by opening and closing the airhole using the tinplate sheet. Adjust it gradually to prevent the flame from extinguishing. The actively white smoke comes out from the chimney. Large portion of this white smoke is caused by the moisture in the bamboo. Since you can't see the inside of the drum can, analysis can only be processed by observing through the smoke. Probably, you can record the smokes in your digital camera for data. After 30 minutes, adjust the hole to about 1 cm. Note: The charcoal might burn and turn into ashes, that it will be necessary to lessen the amount of oxygen to produce good hard charcoal. The difficulty in this process is that no oxygen means no burning and remains as raw bamboo, and too much oxygen means bamboo will turn to ashes. 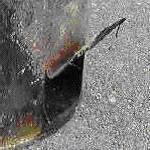 After one hour, if you can understand the flame inside the drum can is all right, adjust the airhole to about 5 mm. Cover the drum can with more soil. At this stage the quantity of smoke decreases and becomes transparent. Up to this point, about 2 hours had passed which is sufficient. Timing will depend on the smoke appearance. 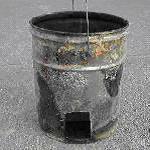 If the smoke is seen very clear like below photo, pull out the chimney and cover the entire drum can with soil. Note: The most difficult with coal making is adjusting the air (the thermal power). Too much oxygen can turn charcoal into ashes, and lack of oxygen won't turn bamboo into charcoal. You need to control the amount of oxygen. It is the experience. 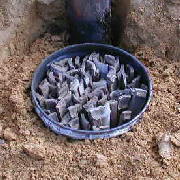 Experience of several degrees is necessary when making charcoal. Now we've reached its final stage after long trial and error experimentation. The combustion process ends in this point. Leave it to be cooled. Charcoal making took about 3 hours only, but let's wait for the next day to take out charcoal. 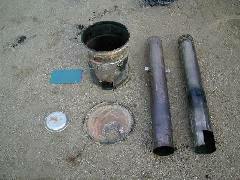 Below photo shows the removed chimney from the drum can. 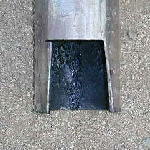 The deep-black liquid has flowed out from connection. 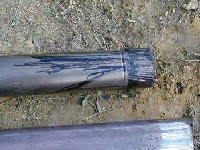 This is the tar of the bamboo. You can use the tar for medicinal purposes which will be explained together with the info on how to extract bamboo vinegar in our upcoming article. The tar and the byproduct liquid called bamboo vinegar can be very useful for our living. 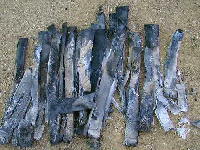 As seen in the photos below, about 27 cm length of bamboo (left photo) shrank to about 20 cm when it turned to charcoal. The weight also reduced to a half or less. From the two photos below, the left shows good charcoal. The right shows one half of the bamboo not being well-toasted. 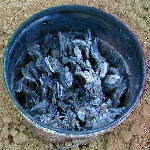 This usually happen at the bottom of the drum can, as flame did not reach the bottom. It's because the temperature is higher on top of the drum can.